If you are getting an error saying “Java was Started but Returned Exit Code=13” during Eclipse installation, then there is a fix for that. Even I faced this problem during eclipse installation on my windows operating system. After searching on google, I found that many of the users facing a similar issue with Eclipse. If you are one of them, then here is the solution for the error. Before going to the solution, let us know why it is showing that error. If you know the problem with this issue, we can easily fix that error. Reason 1: The most common reason behind this problem is, we are trying to install different bit version-that is 64 bit or 32-bit version of the software. It may be either Eclipse or Java. The above are the main reasons causing that Exit code =13 in eclipse. Now let us know how to fix that error. Check which version of operating system you are running. To check that, open windows explorer by pressing a Win+E key on your keyboard. Now on This PC (My Computer) which you found on the left side, Select that and right click on the mouse. In that pop-up menu choose Properties option. When you click that properties option you will see system properties window. In that window have a look on “System Type” option. In that System type, you will see 64-bit Operating System. That’s what we need to know. Now we know which version of the operating system we are running. After knowing operating system version, make sure you downloaded the 64-bit version of Eclipse as well as a 64-bit version of Java software. If you downloaded 32-bit version (X86) of Java or eclipse any one of them, you will get that Exit code=13 error. Please double check the versions which you have downloaded. Because during installation it won’t show any error regarding the incompatible version. It will install smoothly. In my case, I have installed the 32-bit version of Java so I’m getting that error. Maybe you might have made a mistake in configuring Eclipse.ini file, which can be found on Eclipse directory itself. You can check this official guide if needed. The -vm option must occur before the -vmargs option since everything after -vmargs is passed directly to the JVM. You can check the below screenshot of my working Eclipse.ini configuration. You have might have special characters like #, !, @ in eclipse installation directory. That is, if your eclipse installation address contains any special characters, then it shows that error. So make sure you don’t have any special characters. Have you noticed that “#” character? Maybe you are using latest eclipse version and unsupported Java version. 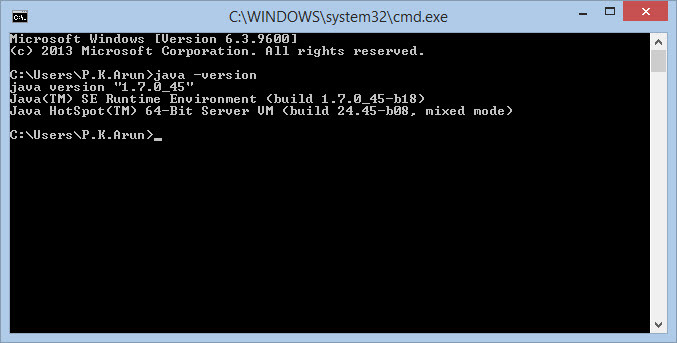 To check which version of Java you are using open command prompt by pressing a win+R key and type cmd and press Enter. Now in that console type Java -version command to know java version. Now research whether Eclipse supports that version or not. You can open “readme” folder in Eclipse folder and open readme_eclipse.html to see which version it supports. I recommend you to download both Java and eclipse the latest version. 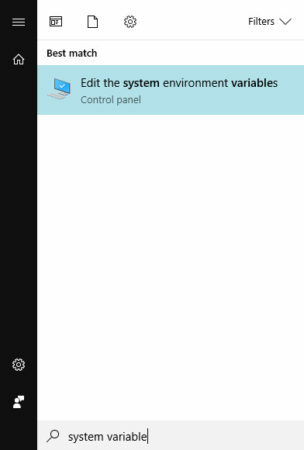 For some user after removing some system variable entry on “Environment Variable” it started working. Search for “System Variable” and Select “Edit the System Environment Variable” option. Hope you have fixed Java was Started but Returned Exit Code=13 Error in Eclipse by following this post. Let us know which reason causing you that error by the comment. thanks!! it helped me a lot !!! Thanks for the informative article. Keep up with the good work. Thanks for the explanation with eclipse configuration file details. That resolved the issue. My configuration file did not have -vm and its path. After adding JDK path it worked like charm. Thanks a lot! very helpful. Thanks a lot! Having trouble with special character. Learned something new from your article. After step 2 (addind -vm c:\progr… ) it has worked. If it gives an error you probably have a 32-bit one. I have checked first two reasons you have given here. And they are not showing. I have just downloaded eclipse and when I run the eclipse application file from eclipse folder this error code=13 is showed. Please guide me what should I do. Hi, please read this article fully. There are 4 reasons which may cause this issue please check all those issue once. i dont know why eclipse stoped to work… i think a update caused this. posted in the comments above. And Eclipse works fine! Thanks a lot! I am sorry. Small correction above, I got the following before I downloaded 64 bit JAVA 8 upd 25. Error: This Java instance does not support a 64-bit JVM. Please install the desired version. Thanks for taking time for explaining your problem that you have faced. I hope someone may find this useful. thank you very much, i can check easily of java version with 32 bit or 64 bit. Thanks a lot ! The solution for reason 2 worked for me. Thank you. My vm path was missing…thanks for the fix! I updated Java and it worked. Thank you for the useful post! This was really helpful…Issue was coming due to Reason1. Thanks!!! And then I can’t run Eclipse. So, what I must do? Download JDK, JVM, or Eclipse? Great work..I had issue number 2. Thanks a lot. Appreciate your work. Just to let you know: it was the reason 2. Solution #2 works like a charm ! thanks a lot and helpful indeed. Thanks. This is very helpful and saved my time. Mi Eclipse funcionaba y despues de instalar la nuevo versión de java ese error apareció, ¿que puedo hacer? i have win 8 and instilling eclipse last virgin with jdk but still the problem …what can i do ..plz?? Thanks Arun, the -vm addition (of case 2) solved my issue quick, clean and easy. Thank you so much … Adding the -vm entry in Eclipse.ini helped me… !! Thanks a lot for this information… It helped resolving my issue. I installed Eclipse eclipse-java-luna-SR2-win32-x86_64 and the ini did not even have a -vm option but once I added it, all was good. +1 This fixed my problem. Thanks man. It was helpful! Recently I had a similar issue, I am on Windows 8 and have version 6 and 7 of Java of both 32 and 64 bit versions installed on my system.I was getting the same error (code 13), all I did was delete “Oracle” folder under “Program Data” folder. Many thanks! Solved with your help. This helped. I was able to get Eclipse to work before but somehow it stopped working lately. 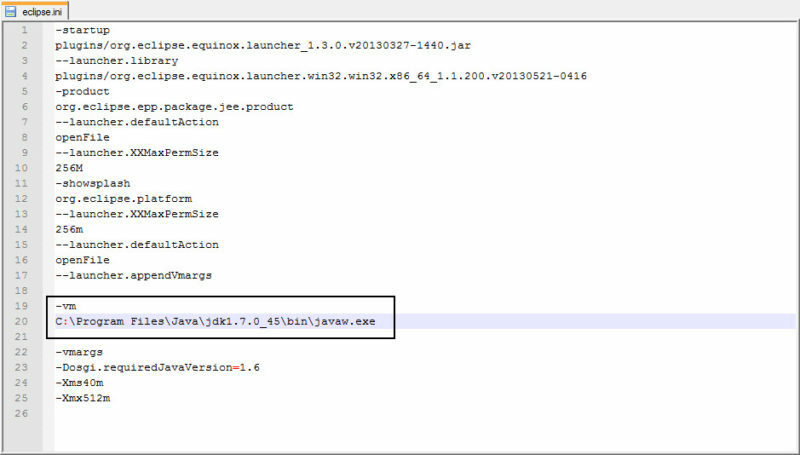 I fixed it by adding the -vm code for the javaw.exe file in eclipse.ini. This work for me . Thanks a lot . it worked for me, followed other blogs too, but this was “to the point”. thanks a lot, keep it up. I hope your first child be a masculine child. Thanks a lot. Thanks a lot ! The problem with me was that i was using the wrong version of Java, i changed de system variable “Path” to get the right path to Java executable and it works now. Thanks for the advice. After opening my eclipse.ini file I noticed that there was no vm specified, i.e. the path to my javaw.exe file. Once I edited the file my eclipse started up and I’m ready to continue reading my copy of Head First – Android Development. Thanks Arun! Thanks..this helped. My eclipse was working fine till I updated to a newer JDK. I don’t know why the problem occured but the solution was to add the “-vm” arg and value in the eclipse.ini file. I was having same issue as Mishal Sanghvi.. updating a new JDK caused this. Thank you so much for you help! Thanks, it worked for me. My reason was No 2. I had to add “-vm” arg and its value in the eclipse.ini file. I guess the source of my Eclipse installation is having this issue. Superb explanation. Crystal clear information. You dont have to visit any other website if you arrive here for Eclipse issues. Its True and article was helpful. I am using the 64 bit JDK. Thanks…. Thank you so much for this useful blog. 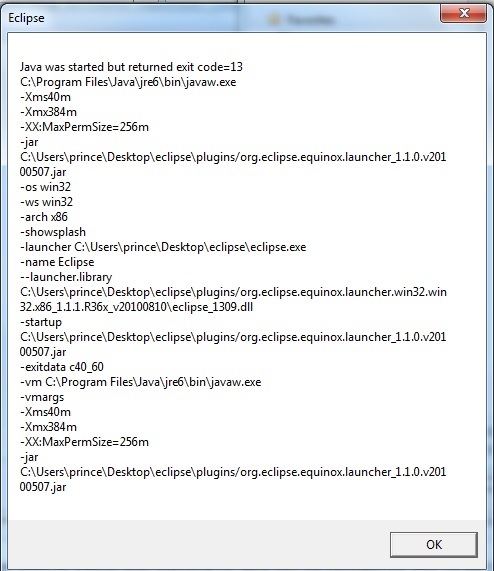 I downloaded a x64-Bit Java version and changed the eclipse.ini as you described. And it works!!!! Thanks a lot, this is the best structured explanation regarding this error. Thanks, Thanks a lot . Thanks a lot I’ve successfully eliminate the error code 13 by following the solution for the reason 2 very helpful ! Thank you for this help full blog. Really appreciate your work. It solved my problem. Your pointer to check the version led me to realize I had installed an older version of Java in order to work on an Android project. That version took over, and Eclipse tried to use it. Specifying a more recent version of Java in the eclipse.ini did the trick. Thank you so much. I had Java for 32 bit. Istalled for 64 bit and now eclipse is launching. I have been using eclipse from past 3 months with the same java configuration . But all of a sudden i am facing this issue today. Neither of the above scenarios are helping me out. Solution 2# worked out for me. Thanks! Great informations – my eclipse luna runs! Solution #2 worked for me. Thanks, man. It seems so obvious, but sometimes I don’t pay attention. Soltion 2 worked out fine for me. after I edited and specified -vm line in eclipse.ini file , i.e. with the path to javaw.exe file. Thanks for jotting it down . Thanks a lot !! I was trying to add the -vm but was doing incorrectly. Thanks for you help. Second solution worked for me. My mistake was “Reason 3: Special characters ( #, !, @) in Eclipse installation directory). I used ‘#’ in name of directory. sir is it necessary to have the same version of operating system as well as java ? Have been trying for two days to get my Eclipse Studio back on line. I followed instructions and it is now working. You are the best! Thank you buddy…that helped me. keep up the good work. Thank you so much. It worked like a charm! Nice explanation, for me its point no. 2. Thanks a lot for your useful post. It helped me solved this problem for me. Thanks, Java version was the mistake. Thank you, this is what I exactly wanted. Thanks, you been a help! reason #2. It is working now. Thank you. Helpful post. Resolved issue. In my case, the culprit was my anti-virus. Actually, anti-virus deletes some .exe files without letting us know. So, I disabled my anti-virus, and installed “jdk-7u80-windows-x64” (64-bit version, in my case) again. And the eclipse worked fine from then. My suggestion for everyone would be that disable your anti-virus before installing any heavy software (like GTA-V, FarCry, Android, PhotoShop, Eclipse, Java, etc.). Nice Solutions, it’s really works superbly. Thanks a lot. I got the solution from the 1st pt (4 reasons for the error: Exit Code=13 ) itself. Appreciate your detailed step-by-step troubleshooting options. In my case i had to update Java from 32bit to 64bit and Eclipse started working like a charm!! As some one suggested in their comments i ran Java -d64 -version command to confirm that i had a 32-bit version which was causing the issue. still not working..what to do ??? In my case Java got upgraded and “javaw.exe” version was incorrect. Thank you very much,getting same error,installed wrong jdk …delete and installed new version working fine. Article is really helpful and resolved my issue, thanks . Thank you! it solved my problem. Awesome…for me it take hardly 5 min to resolve this issue because of above post. Thanks a Lot !! Thank you!! Reason No. 2, really helpful! Phewwww!! Finally it worked, all I had to do was download the correct JRE for my system. Thanks man!! Thanks a lot Arun, your post was very helpful. My Luna now works again. It was like a magic as soon as I added the -vm arguments in eclipse.ini, the eclipse IDE opened. Thanks a lot.. Reason 2 solved my issue! Thanks a lot, I was using JAVA for 32 bit while I’m on 64. Very helpful, solved my problem. Thanks a lot. I switched to 32 bit eclipse, and it started OK. The weird part is that I’m using 64 bit Windows 10 on a 64 bit 2-core hp-pavillion. I have 64 bit system and 64 bit java installed. Somehow eclipse was taking 32 bit path. I installed 32 bit Java and gave -vm with 32 bit jre path. Its working now. Thank You!! Very helpful post. Thanks for you explanation and solution for this issue. I got this problem due to the first reason. I have installed two bit-versions of JDK. Went through your article and resolved my issue. Solution 2 is working for me. Thanks for saving my time. Thanks for adding your solution! It helped me resolving the issue. Thanks for adding this solution. Thank you for the solution. It really helped. Thanks! Reason 2 solved it. I don’t know how the Eclipse was running before that. Thanks, Your solution #2 is worked for me. In my eclipse.ini file -vm pathname itself was not there, after adding this line with path its worked for me. Thank you Arun. Solution 2 works for me. My ini file didnt have a entry with -vm and its path. i have added as per your screenshot and it started working fine. Thanks for this post. I had incorrect version of JRE. After I installed the correct version it worked. -vm section so I added it to the .ini file and problem solved.. I tried installing the jee mars edition and it was missing -vm option in .ini file. Changing it as suggested worked like a charm. Thank you for the information. Really Appreciate it. Thanks Arun. Solution 2 worked for me. Thanks, Option 2 worked like a charm. Thanks a lot. You are a life saver man. Solution 2 worked for me! such an old trick, still works like charm!! Thanks man, option 2 worked for me..
Last point helped me, Thanks! Thank you very much. My problem was in ini file, vm and jre file path was in the same line, which caused the problem. Very cool! I have three problems! Reason 1: The most common reason behind this problem is, we are trying to install different bit version-that is 64 bit or 32-bit version of the software. It maybe either Eclipse or Java. Reason 5 solution. Thank you! Solution 5 worked for me. I would not have guessed that in a million years. Thanks! Thanks very much, reason #5 was my problem as well. Your web page is great! Thanks again. Reason 5 was my problem, and the solution worked! Thank you so much for putting up this guide! Thanks a lot. it helps me lot with option 1. Another trick is to do a search for javaw.exe and add the path to your variables. Many times, you’ll need multiple versions of Java on your machine, and knowing where their path is for each program will help. Good post that was timely help. Saved my day. For me, it was because of the reason 5. IT support failed to resolve it, then I started google and got to this page. Problem #2 was the issue. Thanks a lot. really a helpful post. Awesome. I used Reason 5 Solution. Thanks, my problem was reason #1. turns out even though I got the Eclipse x64 version, I had installed the x86 version of Java JDK. Thanks a lot. Very useful information. 5) Now execute the eclipse.exe and check if it works. Thanks for the info. For me it was reason 2. Reason 1 for me, apparently Java thought it’d be ok to switch to a 32 bit version on updates. You just saved me a lot of time and frustration, thanks! Thanks a lot. Reason 2 solved my problem. I am getting this error only for standard users and not for users whom having admin rights. Please help me on this issue. Thank you! The old JAVA not in the path was my problem. Most of the cases its the combination between JDK, OS and eclipse. Thank you very much for the post. The STS was not getting installed because of the 5th point.Your solution worked !! !